Can one generation restore Canadian whisky to glory? The viscous beige liquid produced here is known as “distillers’ beer,” and it runs through a device called a column still (which resembles the coils on the back of a refrigerator but on a much larger scale), to separate the alcohol from the fermented mash. The resulting distillate, described both as a neutral spirit and a base whisky, is blended with barley and rye-based flavouring spirits produced in pot stills—smaller onion-shaped chambers that yield a fuller-bodied alcohol. Single malt Scotch, made from malted barley, is crafted entirely in pot stills. But since Canadian whisky’s Rat Pack heyday, its reputation has plummeted. “It would not be beyond argument to now call Canadian the forgotten whisky empire,” writes Jim Murray in the 2010 edition of his essential drinking guide, Jim Murray’s Whisky Bible. Within a half century, Canadian rye has gone from being the preferred potable of James Bond—who drank CC, not shaken martinis, in Ian Fleming’s 007 novel Dr. No—to the Canuck-trash sipping drink of Trailer Park Boys’ Jim Lahey, who prefers Alberta Premium. Considered low priced and low class, staid and unimaginative, it’s your dad’s whisky. “There is only so much I’m prepared to drink for my country,” Mordecai Richler once wrote, in reference to Canadian wines during the free trade debate. And when it came to whisky, the novelist who satirized the Bronfman rye barons in Solomon Gursky Was Here preferred Macallan single malt for his personal consumption. The word “whisky” transliterates the Gaelic word “usquebaugh”: pronounced “whis-ge-baw,” it means “water of life.” Unlike the Irish and the Americans, Canadians take after the Scots, spelling “whisky” without an e. Nonetheless, our distilling culture is not drawn from just one pool of immigrants. The first Canadian distillery, which produced rum, was established in Quebec in 1769. Later in the eighteenth century, Loyalists with Scots-Irish ancestry and experience making whisky from rye and corn in home stills arrived in Upper Canada from the former American colonies. By most accounts, John Molson, the legendary English brewer, opened the country’s first commercial whisky distillery in 1821. Most of the 200 or so distilleries that followed in the first half of the nineteenth century, like the one founded by James Worts and William Gooderham on the Toronto waterfront in 1837, were tied to existing milling operations as a means of using up leftover grain. In their first year, Gooderham and Worts produced 4,682 gallons of whisky; by 1861, the distillery was churning out 2.5 million gallons a year. Whisky was sold directly from the barrel to customers who filled their own jugs, and was aged haphazardly—only if it didn’t sell. Canadian whisky’s rise as an export commodity stems from a combination of quality, historical circumstance, and astute marketing. In 1858, Hiram Walker, an American who had previously been the proprietor of a grocery store in Detroit, built a mill and distillery on 190 hectares of Upper Canadian land to make whisky to sell across the Detroit River. At the time of his death in 1899, his blended Canadian Club, originally known only as “Club” when it was launched in 1883, was popular enough in the States to be fraudulently imitated by US competitors, which produced “club” whiskies that claimed to be made from a “Canadian Process.” To alert consumers, Hiram Walker & Sons published a circular in 1900 that identified forty-two knock-offs. If Prohibition lent Canadian distillers an underworld lustre, the period following its repeal in 1933 saw our whisky become a global giant. While American producers were reopening their shuttered distilleries, Seagram’s president Samuel Bronfman prepared by collecting additional stock beyond what the firm was already selling—even maturing his blends’ base whiskies, which hadn’t been done previously. In 1936 alone, premium brands like VO and 7 Crown, an American blend made to Bronfman’s exacting specifications, racked up $60 million in US profits for Seagram’s, and an additional $10 million from Canada. Three years later, Bronfman celebrated King George VI’s visit to Canada by launching Crown Royal, soon to become Seagram’s flagship rye label. Between these extremes, Canadian whisky caters mainly to a constituency of aging drinkers happy in their rut. Nationally, sales of this spirit category have dropped from 4.7 million nine-litre cases in 1990 to 3.7 million cases in 2005—the same year domestic and imported vodka together first surpassed rye as the leading liquor. How can Canadian whisky be taken seriously, Murray suggests, if we can’t take it seriously ourselves? Vancouver’s Habit Lounge offers modern renditions of throwback pleasures. A deer’s head made from orange papier mâché is mounted on a wall and illuminated within, drawing out the amber polish of the bar’s patent leather booths. 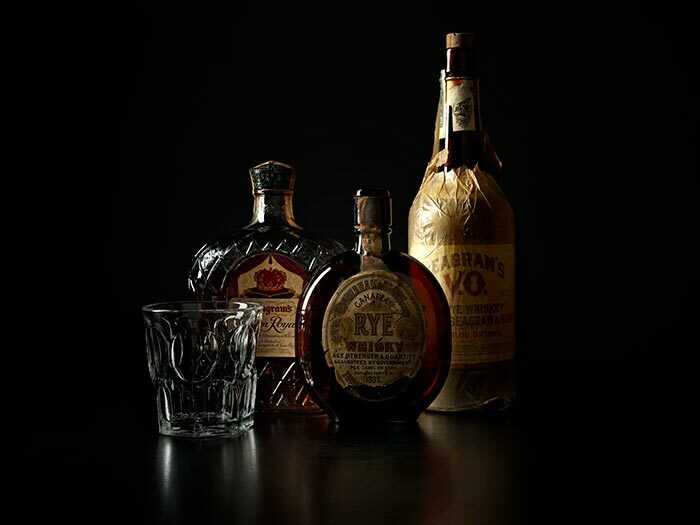 In keeping with this revivalist attitude, Habit maintains a comprehensive Canadian whisky selection. You can ask for a shot of Black Velvet or Danfield’s Private Reserve in a manhattan that’s served “bento box” style, in a little kit that lets you fix your own drink. The emergence of bars like Habit and the TV series Mad Men—whose lead character, Don Draper, keeps a bottle of CC by his desk—have given Canadian whisky makers a beachhead for attracting new drinkers. Three years ago, Canadian Club launched its “Damn Right Your Dad Drank It” campaign, which featured vintage photos of men fishing and relaxing in shag-carpeted rec rooms above assertively masculine tag lines: “Your Dad Was Not a Metrosexual”; “Your Mom Wasn’t Your Dad’s First.” The new “Hide a Case” promotion, in which contest winners search for cases of CC in far-flung locales like Loch Ness and Robinson Crusoe Island, relaunches a campaign that ran from 1967 to 1991. Starritt, however, seems more interested in a handful of boutique distilleries that are expanding Canadian whisky beyond its traditional definition as a blended, rye-flavoured spirit. Glenora, a distiller founded in Cape Breton in 1990, became Canada’s first producer of single malt whisky, with its Glen Breton Rare. The spirit’s style and Scottish-sounding name caught the attention of the Scotch Whisky Association, which decried it as an imposter and sued. In 2009, the Supreme Court of Canada sided with Glenora. Each distiller has created a Canadian whisky on its own terms. Yet lacklustre marketing, misinformation, and reflexive feelings of national inferiority keep the greater drinking populace from sipping it alongside the finest bourbons and Scotches. “Most people prefer single malts because they’ve been told they’re better,” argues de Kergommeaux. “No one’s telling them how great Canadian whisky can be.” As with our singers and athletes, Canadians are waiting for outside affirmation before we again drink for our country—a cultural attitude even more old-fashioned than the spirit we dismiss.